Tech-Simply: What are these small,mysterious, moving-fibre like thing often seen in sunlight?? What are these small,mysterious, moving-fibre like thing often seen in sunlight??
" Oh squiggly line in my eye fluid. I see you lurking there on the peripheral of my vision. But when I try to look at you, you scurry away. Are you shy, squiggly line? Why only when I ignore you, do you return to the center of my eye?" They had been puzzling me for a long time and finally i got the answer. 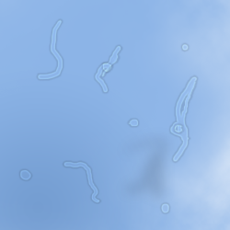 These mysterious little objects are called "floaters".Floaters are little "cobwebs" or specks that float about in your field of vision. They are small, dark, shadowy shapes that can look like spots, thread-like strands, or squiggly lines. To understand these floaters we need to know a little about the structure of our eye.A large portion of the inside of our eye (between the eye lens and the retina ,if we think of the cross section) is filled eith a clear liquid gel known as the vitreous humour .The vitreous humour is almost completely transparent at a young age ,but it acquires deposits over the years. Floaters are suspended in the vitreous humour. They are not optical illusions since they exist within the eye. Floaters are usually seen when looking at a uniform blank surface or an open monochromatic space such as a blue sky.The brightness of daytime makes our eye pupils to contract, reducing the aperture which makes floaters less blurry and easier to see. These floaters are just imperfections and mostly not of any colour of their own,we can see them only if they do something to light which is either Obstruction (they cast shadows on the retina) or Refraction(slight deviations of light passing through them) both picked up against a suitable background. Now, these deposits move with the eye, so we typically keep 'chasing' them till we get bored, or till they disappear.